St. Andrew's current rector is Reverend Dr. Joseph W. Wilkes. Reverend Joe came to Saint Andrew's as a transitional deacon in the fall of 2006, after his graduation from Episcopal Divinity School and ordination to the diaconate earlier that spring. He and Saint Andrew's felt called to remain together when he was ordained priest in January 2007, so at the request of the parish Bishop Tom Shaw appointed Joe Priest-in-Charge for a three year term. As that term came to a close, Joe and the parish engaged in prayerful discernment leading to Joe's being called to remain at Saint Andrew's as rector. Rev. Joe came to priestly vocation by a circuitous route. His first vocation is oral and maxillofacial surgery, which he continues to practice part time in Boston because the rector position at Saint Andrew's is part time. Joe is a graduate of Tufts College, Harvard School of Dental Medicine, and Harvard Medical School. His residency in oral and maxillofacial surgery was at Massachusetts General Hospital. In addition to clinical practice, Joe has worked as a senior health care executive in the areas of medical peer review, quality assurance, and performance management. It was through Rev. Joe's experiences in clinical practice and health care management that he discerned a deep desire toward providing pastoral care. This lead to his discernment with the Episcopal Diocese of Massachusetts that he was being called by God to Holy Orders and priesthood. Rev. Joe loves parish ministry, especially the part time nature of it a Saint Andrew's. This is because part time ministry encourages, and actually requires, that active collaboration of clergy and lay people in ministry and the work of the parish. This is something Joe feels very strongly about and something the people of Saint Andrew's are very good at. Rev. Joe's favorite parts of his ministry are liturgy and pastoral care. Rev. Joe's wife Karen is a full time physician specializing in neonatology, the intensive care of newborns. They have a daughter Caroline and a son David, who are college students. They live in Melrose. If you're new to Saint Andrew's, make sure you say hello to Rev. Joe. He loves to meet new people and chat. The vestry is an elective body in an Episcopal parish composed of the rector and a group of elected parishioners administering the affairs of the parish. As the Body of Christ, St. Andrew's is a spiritually diverse community committed to the realization of our Baptismal Covenant. Shortly after 10:30 on Thursday morning, September 21, 1905, Professor Ernest Douglas of Boston took his position at the organ, as a choir of boys from the Church of the Advent, Boston, and All Saints' Church, Methuen, entered the church. Led by Bishop William Lawrence, the congregation gathered to celebrate the consecration of the new church building for All Saints', which had been organized in 1904. In this church building, forty five years later, the congregations of All Saints' and nearby St. John's, Lawrence, combined, renaming their new home St. Andrew's Church. The erection of the church was made possible by the generous gift of Edward F. Searles of Methuen. Mr. Searles was a multimillionaire who had an ambitious and peculiar plan to establish Methuen as a cathedral city for Essex County and southern New Hampshire. Plans for the church were drawn by Henry Vaughan, who considered All Saints' one of the most important half timbered churches that he had designed. With the opening of the new All Saints' Church, Methuen acquired a beautiful building, rich in architectural features, and most substantial in construction. The church is set on a bottom half of local granite above which is the half timbering characteristic of Vaughan's work. The ends of the church are balanced by a broach spired tower and a gabled sacristy. Among the interior appointments is a one-piece rood screen made by the Lang family of Oberammergau from wood of the Black Forest in Germany. The parish's fine organ was built by the Methuen Organ Company in 1905. The factory of the Methuen Organ Company was located on the grounds of the Methuen Memorial Music Hall, where the parking lot presently exists. At least partially financed by Edward Searles, the company was run by James Treat. Meticulous craftsmanship using the finest materials is the hallmark of Methuen Organ Company's instruments. The organ in St. Andrew's has 2 manuals and 22 stops, with tracker-pneumatic action. Its case is unusually handsome, featuring carved quarter sawn white oak and case pipes of polished tin. You can find more details here. Above the baptismal font at the south end is the great Gothic window of cathedral glass. The building is especially well supplied with light from its many handsome, diamond pane windows. The basement contains a large Sunday school room and library. In 1905 the building was complete in every appointment; not even the smallest detail was omitted. All Saints' began on a strong footing in 1904 with 164 communicants, many of whom had belonged to St. Thomas's Church of Methuen, which was forced to close its doors in 1901. The new parish continued successfully until 1917, when there was a sharp decrease due primarily to World War 1. In 1919 attendance began to increase again, and remained at about 125 communicants until the early 1940's. Then, with the outbreak of World War II, parish attendance dropped steadily. The decline of the mills following World War II and their move southward prevented the church from regaining its full numbers. At this time St. John's Episcopal Church of Lawrence also suffered a severe drop in communicants, due to the economic decline of the area. The vestry of All Saints' Church and St. John's met with the approval of the diocese to talk of a merger. Discussion led to agreement in 1950 and All Saints' Church was selected as the better structure to house the new congregation. In order for the merger to be complete both churches thought it best to choose a new name, and thus the new parish became St. Andrew's. When the Rev. George Argyle was called as rector in November 1951, the parish was growing at an exceedingly fast rate because of the combined congregations. The parish hall that housed the Sunday school classes was overcrowded and every available space was being utilized. Parishioners voted at the annual meeting in 1953 to build a new parish hall. In view of the need to raise over $60,000, the vestry was authorized to organize a fundraising committee. This was the first major project to be shared by the parishioners of St. Andrew's, and they reacted with great enthusiasm. It gave them a feeling of family, all striving for the same goal. On February 28, 1954, ground was broken for the parish hall that would include a basketball court, a stage, and a fully equipped kitchen. On September 19, Bishop Norman B. Nash dedicated the new facility. The parish continued with steady growth during the fifties and sixties under the guidance of Mr. Argyle, listing 500 parishioners. By 1960 the need to renovate the original Sunday school rooms was met, and again in 1968 with more growth a memorial parlor addition was completed, providing the meeting room, choir, and acolyte vesting areas that were so badly needed. Mr. Argyle, who retired in 1970, served as rector emeritus of the parish until his death in 1988. He was the only rector emeritus to actively watch the parish continue to grow. Rev. Fred Cunningham served as rector from 1971 to 1976. Rev. Cunningham was well liked, especially by the young people. He was very talented musically; and he often played the organ well and with great passion. In April of 1977, Rev. John Phelps was called to the parish. Under the spiritual guidance of Rev. Phelps, St. Andrew's continued steady growth to 570 baptized members. Weekly attendance improved, along with involvement by the laity in parish life. Rev. Phelps left St. Andrew's in December of 1989. The parish worked through a period of six interim rectors until December of 1992 when Rev. Paul B. Bresnahan was called to the parish. After Rev. Bresnahan's call to a parish in West Virginia, the church had interim rectors, Rev. Thomas M. Kershaw and Rev. David K. Johnston until 1999 when the Search Committee called the Rev. Caroline Diamond Redmon from California. When Rev. Caroline was recalled to California in 2001, the parish decided it was time for a period of self-discovery and renewed mission. The Rev. 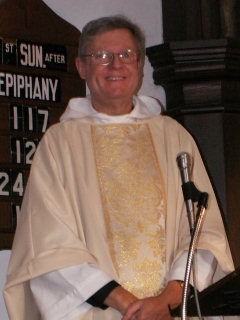 John Bonell was appointed as Interim Priest from May 2002 to September 2003 and worked with the parish as it wanted to prepare itself to enter the search process. Memorial carillons were dedicated in November 1982 by the Right Reverend Morgan Porteus, Bishop of Connecticut, to enhance worship and announce the presence of St. Andrew's in the community. The parish has come to realize the rich heritage it has in this church's history and architecture. The year 1983 marked the beginning of the preservation and restoration of the entire structure, when parishioners voted to raise $150,000 for a restoration fund. During the next five years, our efforts turned to the preservation of St. Andrew's Church building on the spirit of the present for future generations.